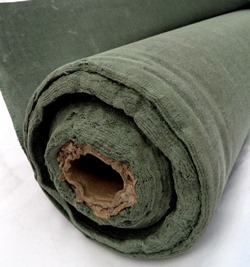 Our Heavy Duty Canvas tarpaulins are manufactured from single filled cotton duck. Imported from India, these heavyweight sheets are 15oz before proofing, resulting in a robust finished weight of 21oz/710gsm after treatment. 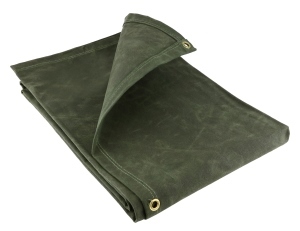 A dark military green in colour, these hardy Canvas tarpaulins offer premium resistance to abrasion and punctures while remaining breathable. Rust resistant brass eyelets are set into strengthening tabs at 2ft intervals. Hems and seams are single-stitched. Fabricated from a natural fabric, these tarps are breathable; however a minimal amount of shrinkage can occur where canvas tarpaulins are subject to varying temperatures. Our robust canvas tarps are wax-proofed to make them water-resistant; they will require re-treating after exposure to water, in order to maintain their resistant properties. For more information on our Canvas range, you may find it useful to click here. 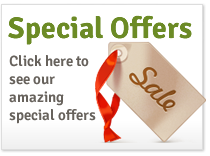 Our 21oz canvas is also available on a roll, size 6ft x 80ft / 1.8m x 24m. 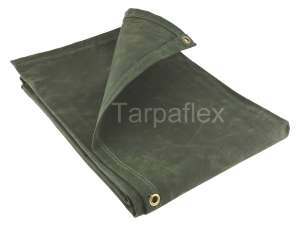 Popular with tarpaulin fabricators, the Canvas roll is sold without eyelets, hems or seams. Please note that due to packed dimensions this item cannot be sent on a next-working day service. 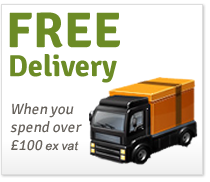 Goods will be sent on a 2-3 day delivery service, we cannot guarantee 24 hour delivery. These tarpaulins are wax-proofed and have been dyed, and so there can be a risk of colour transference upon application - please take caution. 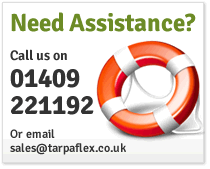 We do not recommend that these tarpaulins are suspended solely by the eyelets if using as an outdoor canopy. It is highly recommended to use a ridge line, or a couple ridge lines on larger sizes, made of rope or bungee which will help support the weight of the tarp. This will also help with a run-off of water as water can pool if tarps are suspended only by the eyelets, adding extra pressure and weight. Use as many of the eyelets provided and install additional eyelets if required, especially if there are stress points. Please Note: our tarpaulin sizes are 'cut sizes' which is industry standard terminology for the size of the material before it is fabricated into a tarpaulin. Therefore expect the 'finished' size to be up to 30 cms shorter, and up to 45cm on very large sizes. Most tarps will have a seam as they are fabricated by heat sealing several pieces of polyethylene together. Please Note: All our tarpaulin sizes are 'cut sizes' which is industry standard terminology for the size of the material before it is fabricated into a tarpaulin. Therefore expect the 'finished' size to be up to 30 cms shorter, and up to 45cm on very large sizes. Most tarps will have a seam as they are fabricated by heat sealing several pieces of polyethylene together.